right in front of their eyes, week after week? That is the premise behind such programs as ABC's "Making of the Band", which spawned the painful O-Town, and the WB's "Popstars." While O-Town centered around a group of boys with ambiguous sexualities, "Popstars" let us watch as a pool of hotties crooning "I Will Always Love You" was systematically pared down. The end result? Quintet "Eden's Crush", which resembles an even lighter-skinned Destiny's Child - give or take an expelled member or two. Things boded well for the group as "Get Over Yourself," the first single, exploded onto the charts. 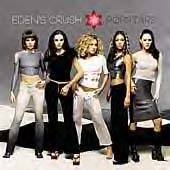 Eden's Crush made history as the first pop group to have a debut single open atop the sales chart. Additionally, their first chart appearance on "Billboard's Hot 100" was an impressive #8 - the second highest debut of the last five years (behind Garth Brooks/ "Chris Gaines"'s "Close to You"). It seemed the formula was working. However, with the May 1 debut of "Popstars," the full-length album, it became suddenly apparent that somewhere along the way, the formula went drastically awry. To figure it out, let's look at it piece-by-piece. know the girls can sing, too, because we watched them belt out song after song to get plucked from a sea of hopefuls. The problem with Eden's Crush instead is the one thing that's even more formulaic than the group's selection process - the writing! Of the 12 tracks (13 if you count the hidden one, the ballad "Promise Me", which proves among the best), the vast majority sound as if they were passed over by the Britneys and Christinas and even second-stringers like Mandy and Jessica. Filler on a disc isn't uncommon, but entire discs of it rarely sells - and that's a conundrum Eden's Crush isn't going to overcome. After repeated listens, tracks like "Let Me Know" and "No Drama" verge on enjoyable - but are still easily forgettable. Few tracks contain a memorable, infectious hook - the part of a song everyone should remember. Even "Get Over Yourself," which stands to become the group's single hit, never fully implants itself in the listener's brain. "You Know I Can" -- quite reminiscent of The Spice Girls at their most popular and outright popish - bridges beyond disposable. Disc-opener "What's Good 4 the Goose," which has a strong, enjoyable beat, suffers from frustratingly simplistic lyrics. The standout track, and most likely to make inroads at radio and with fans, is the group's respectable, straight-forward cover of Sheila E's smash hit "Glamorous Life." Tapping into the '80s is hot right now, and this song is primed and ready for summer. Older fans will remember and appreciate it as nostalgia; younger fans can discover it for the very first time. Hopefully programmers will give this knock-off group a chance. It's a sad statement when the freshest sounding cut from a new artist is a remake. However, where Eden's Crush is concerned, that's undeniably the case. Perhaps for "Popstars II," the inevitable sequel, finalists from a group of prospective writers can contribute the songs. They certainly couldn't sound more blasé or worn. Whatever the case, next time the WB takes the time to assemble a group of talented, beautiful women, they should make sure they're given better material to work with after-the-fact.